Our Caterpillar Progress site was given the Platinum Award for Most Creative Overall by the League of American Communications Professionals with in their 2008 Spotlight Awards Print, Video & Web Competition. 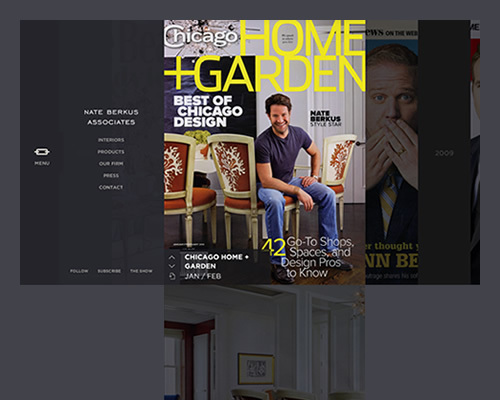 Our Caterpillar Progress site made Step Inside Design Magazine’s 2008 Best of Web list. Read about it here or below. Caterpillar’s signature-yellow construction and mining machines are icons of American industry: For more than 80 years, that equipment has been building the world’s infrastructure. 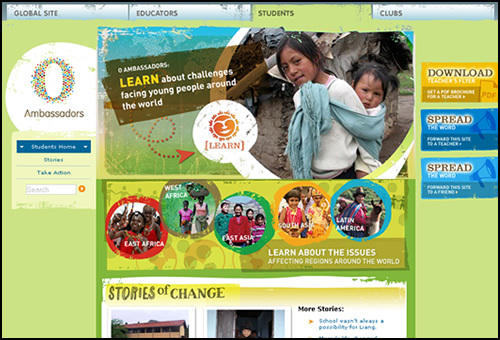 In 2005 VSA Partners helped create the company’s first global reputation campaign in a decade. Specifically, the campaign targets audiences worldwide who are not aware of Caterpillar’s status as a global, environmentally conscious, technologically sophisticated company, or of its contributions to economic and social progress. The campaign, “The World: In Progress,” consisted of print, out-of-home and radio advertising. 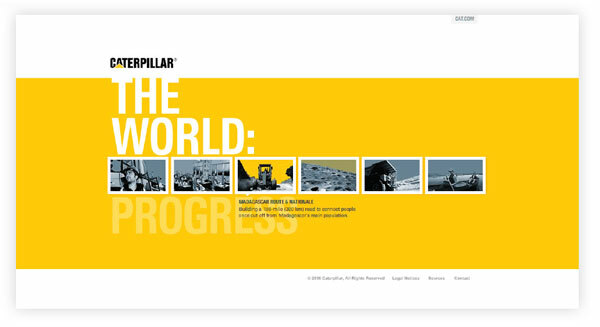 Launch of the campaign’s website in March 2008 marked the beginning of a bold online presence designed to further strengthen Caterpillar’s reputation. 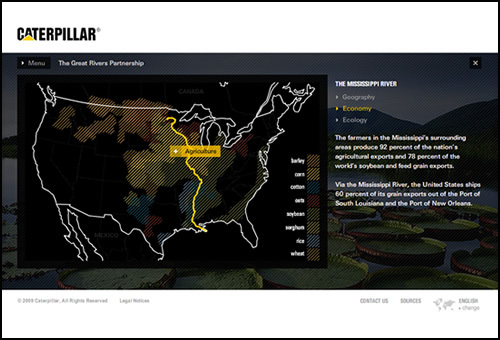 The VSA/Caterpillar partnership encompassed the development of Caterpillar’s strategic intent as a company, internal and external research, development of communication strategies and creative execution across employee, dealer and public audiences. The World: In Progress reflects corporate strategy and values. It recognizes that progress can mean different things to different people. For a small African village, it could be a road that connects the town to a larger economy. For a developing nation, it could mean finding alternative means to meet growing energy needs. The campaign emphasizes that no matter what form progress takes, Caterpillar makes it possible. It’s this potential of what the world can be that is the idea behind the campaign. “The campaign focuses on expanding Caterpillar’s strong reputation beyond what it makes, to what it makes possible,” says VSA creative director Patrick Heick. As banners go, these ones I did to promote the Caterpillar Progress site are pretty cool. They are your typical annoying ones that open over page content when rolled over. I did 3 different sizes of the ad. And I used the PointRoll Flash API for tracking. I’ve been working on this one for the last few months. This is my first use of SWFAddress which is pretty slick, though we’re having some issues with URL redirects and frames that we have to use in the live environment. It works great in my testing environment though! This as a deep and complicated site. Here’s what’s in there along with some of what I learned. I created a custom photo gallery/image viewer (in the Great Rivers and Madagascar sections) which loads images, and when they are viewed, compares the dimension ratio of the pic to the viewport to determine how the photo should be resized and animated. The video player is a re-skin of the FLVPlayback components. The designers put an empty spot on either side of the seek bar handle which was a trick to figure out. The solution was to use blend modes to erase the necessary area. The text is loading via XML because we will be updating the site later with other languages. I learned a lot about encoding videos for Flash using Quicktime Pro and On2 Flix Pro to get things done. Update 2: Added a few stories and changed the menu navigation. The menu is no longer a global piece that drops from the top. Now you have to return to the menu page. Here is a nice piece I’ve been working on at DK for the next version of the Brookfield Zoo’s site. The cool part is the scrolling zoo explorer. 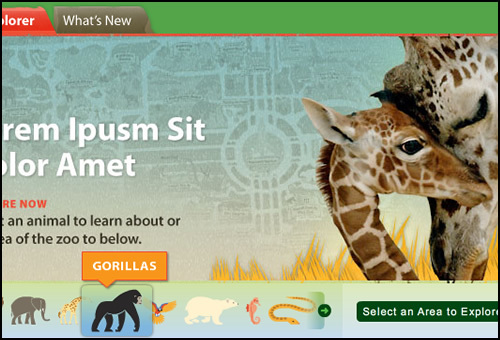 Click the “Zoo Explorer” tab at the top left and then play with the scrolling functionality at the bottom left. I had to use a combination of enter frame events, setInterval, and tweening to get the right feel. Notice the elastic bounce when you hit the end of the slider. And notice that the momentum / inertia increases as you hold down the buttons. The animal scroll bar is built dynamically, with paths to each animal’s SWF file, its name, and its link defined in the XML. As each animal loads, the slider is dynamically resized, and animation variables adjusted. The rotating images under “What’s New” and their respective links are defined in an XML file. Under the “Zoo Explorer” the text and links in the drop down (or up) are defined in another XML file. As the file is parsed, the menu is built dynamically to the correct size. Update: The new Brookfield Zoo site is up. Here is the live zoo explorer with a Noah’s Arc-boatload of animals. One improvement I could have made would be to have used 9-slice scaling for the roll over background rectangles behind each animal. Oh well. 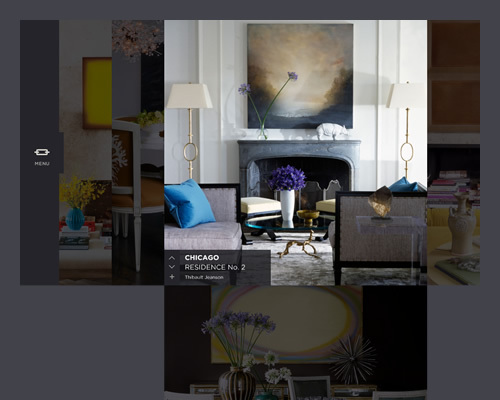 Here are some zippy timelined animations I did with Design Kitchen for the new Oprah Ambassadors site. I created two animations for the Dayton Flyers Basketball 04-05 and 05-06 season. These animations play during the players’ introduction and warm up on the school’s new LED boards placed under the scorers’ table. I created the animations in Flash and Swift 3D then exported the final file as an AVI. The animation may appear choppy the first time through as it loads. There is no pre-loader because the final product was an AVI. I created this scrollbar back in the days of SmartClips, Flash’s precursor to Components (which actually made this obsolete a few months after creating it). I was successful in mimicking the Windows scrollbar exactly to use it in various Flash applications. Try adding and deleting text to see the scrollbar adjust itself. Also try using the scrollbar as you normally would; drag it, click the arrows, click the negative space between the arrows and the dragable part, etc. Notice the delays when you click and hold the arrows ant the negative space. 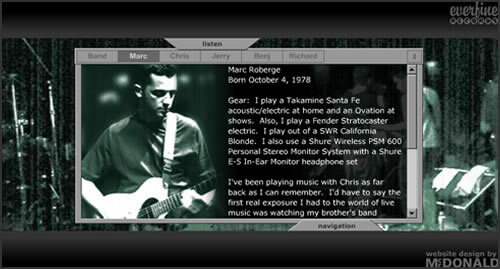 The SmartClip was used throughout the site I did for O.A.R. Note: This is old stuff. This was my biggest project as a freelancer from back in 2001, and I think the site speaks for itself. Designed around the band’s story of a wanderer, the user wanders through the site to learn about the band, check tour dates and more, all with the ability to listen to their music. The site launch coincided with the release of the band’s 3rd album, Risen. The Flash based music player was one of the first of its kind. It was designed before Flash had any run-time mp3 (which means there was a FLA and published SWF for each and every song, at a high and low bitrate version) loading capabilities and allows users to listen to the group’s music without opening other programs like Windows Media or Real Player. The home page, discography, and tour dates (using Flash’s new XML parsing feature) are all dynamically loaded through ASP and Access databases. Be sure to try the music player as it is the highlight of the site, and was especially innovative when the site was released in Feb 01.